Posted on February 1st, 2011 in Events. 2 Comments. 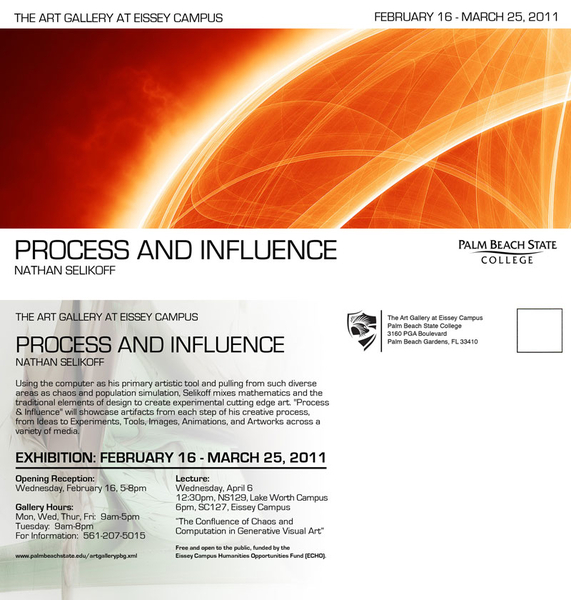 You are invited to the opening reception of my first solo exhibition! Using the computer as his primary artistic tool and pulling from such diverse areas as chaos and population simulation, Selikoff mixes mathematics and the traditional elements of design to create experimental cutting edge art. Process & Influence will showcase artifacts from each step of his creative process, from Ideas to Experiments, Tools, Images, Animations, and Artworks across a variety of media. You can view the entire print invitation below. I hope to see you there! Would love to know how you were influenced in your artwork.